Sick of rising rail fares and chaotic commuting? Tired of the endless tinkering with our broken privatised railway system? The Use of Nazi Imagery in Campaigning – is it unfair to the Tories or a True Reflection? The austerity programme was initiated in 2010 by the Conservative and Liberal Democrat coalition government. It has brought in its wake the destruction of many social support systems for all of us but for disabled people it has meant a severe decrease in our ability to engage in life. The demise of the Independent Living Fund, reductions in social care, the unwillingness to consider medical evidence, the restriction on support … the list goes on. Whether you accept the concept of equality or not, the fact remains that our world is essentially constructed for bipedal creatures with a given capacity for sight, hearing and mobility. The world is eminently suited for all those who can climb stairs, read basic instructions, have a basic understanding of language and its usage and can perform a given set of functions on command. Fail in any of those and you are considered disabled. In relatively primitive societies when babies were born with the clear indication that they would never attain the full physical capacity they were exposed on hill sides and left to the elements. One society we know of was Sparta. Plutarch, aka Lucius Mestrius Plutarchus, gives us the Greek story that ancient Spartans threw their stunted and sickly babies off a cliff. Whether this story is true, or a myth, is at this moment immaterial. The fact is that the belief that this was true has fed into social movement such as the Hitler Youth. In the early 1920s, the Nazi party had established a youth movement to train them to become Stormtroopers. The idealisation of perfect people with the full capacity of bipedal motion reading basic instructions, having a basic understanding of language and its usage and capable of performing a given set of functions on command was the underpinning of much of the Nazi Party ideology. They of course took it one step further still in that they also held that the Aryan was the only perfect exemplar of these perfect people. But that is by the by. What is relative to this article is that the Nazi ideology led to Aktion T4. Starting as a euthanasia program that eliminated disabled infants and children deemed unfit to live and expanding in time to cover disabled adults and the elderly. Aktion T4 was a direct result of a new bureaucracy with a mandate to kill anyone considered to have a “life unworthy of living”. The Nazis themselves referred to the victims of Aktion T4 as “burdensome lives” and “useless eaters”.Criteria for inclusion into the programme was not exclusively medical or genetic. People were assigned to the programme largely on ‘Economic Productivity’. Aktion T4 killed 70,000 people during its first two years of operation. Initially by starvation and lethal injection. Later, efficiency led to the development of asphyxiation by poison gas. The program officially ended in 1941 amid a welter of protests from many quarters of German society. It however did go on more covertly. The total number of victims are estimated to have reached 200,000 plus. Furthermore, it was the lessons the Nazis learned from Aktion T4 that helped them later on in their ‘final solution’. We have all heard about the Yellow Star that Jews were required to wear under the Nazi Regime. This was but one of the classification symbols Nazis employed. Notion that the star is but two triangles, one inverted on the other, was employed to classify people depending on their origin, their sexual orientation, their political affiliations, their religion and their overall productivity towards the Nazi war effort. Disabled people, those considered unfit for ‘economic productivity’ and eventually all others who were deemed ‘anti-social’ by the regime were accorded a Black Triangle. Which, incidently, is why the DPAC logo contains a black triangle at it’s centre. Coming forward to the present day, prior to the Austerity programme, there were still many matters lacking for the ability of disabled people to fully engage in public life. But things were improving slowly, admittedly, but surely. We were gradually getting the notion of the Social Model of disability accepted. The notion was become accepted that people were disabled not by their impairment but rather by the society they were living in. All that went to the wall with the Austerity programme. We are currently facing the basic notion that impairment is a personal fault that society does not have to make room for, make concessions to or accept responsibility for. Unlike Aktion T4, the Austerity programme has not quite taken an active hand in killing disabled people. But disabled people are still dying as a result of austerity. Many disabled people do view the assault on their ability to engage in public life by the myriad of cuts, both in personal support and in social support, as akin to the intent of Aktion T4. I posit that this view is far from irrational. In fact, it is the only logical way to see the impact of the Austerity programme which is essentially a means of minimising Governmental responsibility for those it governs. Governments are there to set the stage on which we live our daily lives. If it makes it more difficult, or rather impossible for some of us the traverse that stage then government policy is wholly responsible for our inability to live full lives. Austerity is responsible for killing each and every person who has found it impossible to live up to the expectations of economic activity as set by the governments that have initiated, and followed, the precepts of Austerity. Further, call a rose by any other name, and it still has thorns. Saying that Austerity is over has not meant that the impact of Austerity is no longer there. As long as disabled people are forced, through the actions and lack of action, by this or any other government, to live restricted lives, through lack of social support, we will, quite rightly, continue to see their actions, or lack thereof, in the same light as Aktion T4. A police force has admitted passing video footage and other information about disabled anti-fracking protesters to the Department for Work and Pensions (DWP). Disability News Service (DNS) reported last week that forces including Lancashire police had been accused of repeatedly targeting and assaulting disabled people involved in peaceful anti-fracking protests. Many of the allegations concern the policing of peaceful protests about the drilling activities of the energy company Cuadrilla near Preston New Road, on the edge of Blackpool. But DNS has also spoken to disabled protesters who say Lancashire police has passed information about their involvement in the protests to DWP, in an apparent attempt to have their disability benefits removed. Lancashire police this week confirmed to DNS that it had passed on information and footage of disabled protesters at Preston New Road to DWP. Despite this admission, DWP would only say that it had no “formal arrangement” with any police force to pass it information about disabled protesters, and it refused to say if the department had received material from Lancashire police. Jonathan Bartley, co-leader of the Green party, and John McDonnell, Labour’s shadow chancellor, have described the police force’s actions as “shocking” and “unacceptable”. Nick Sheldrick, a wheelchair-user with a spinal cord injury, was astonished to be called in for a reassessment of his industrial injuries disablement benefit just two months after he began attending protests at Preston New Road early last year. Sheldrick, who used to work in the merchant navy and was injured while working on a ship, had received a lifetime award and said his doctor could not understand why he had been sent in for a reassessment. He said he had heard of “quite a few” fellow protesters who had been called in for benefit assessments. Another of the Preston New Road protesters, a disabled woman with a fluctuating condition, had her Motability vehicle removed after her claim was suspended by DWP. She is being told to repay months of disability living allowance and now faces the possibility of court action. She was told that police had sent footage of her at a protest to DWP, and she was even told by a police officer who stopped her while she was driving to a protest in her Motability vehicle that they were “duty bound to tell Motability that you’re using your car for illegal purposes”. She later received a letter from DWP saying that her claim had been suspended, which led to her losing her car, and she was then interviewed under caution and ordered to pay back £6,000 to DWP, while a file has been sent to the Crown Prosecution Service. She was asked in the interview about footage that showed her walking a few steps forward and then a few steps back, and about being seen leaning on a bicycle as she walked up a hill. She said: “What they were saying was absolute rubbish. Where are the photos of me falling over, me sleeping for 12 to 16 hours? Another disabled eyewitness who has spent time at the Preston New Road site and knows this protester said this week: “I weigh up how I am going to spend the energy that is available to me that week and my capacity for [coping with] pain. “It is a conversation that she and I have had about how we both – for any activity we do – will either spend time resting up in preparation to be able to do it or resting up to recover from it and to cope with the pain that has been caused. “Police and DWP are trying to curtail people’s human rights by trying to stop them protesting. But she said that she and others make this decision to stand at the gates in pain “knowing it is going to cost [us] a lot of exhaustion later”. Bartley, who has visited Preston New Road and spoke to Disability News Service before the police admitted passing the data to DWP, said if it was true that information had been given to DWP about protesters who claim disability benefits it was “absolutely shocking”. He said: “The police and DWP need to come clean and make clear if this is happening. “There needs to be full disclosure if this is the case. That would be an underhand tactic with dreadful consequences. It would clearly be unjust. McDonnell, who has also visited protesters at Preston New Road, says in a film about the targeting of anti-fracking protesters, produced for Netpol by Gathering Place Films, that the passing of such information to DWP by police was “unacceptable”. He says in the film: “Does this mean disabled people can’t protest? That’s ridiculous. “What we need to do is expose this. We can’t have the targeting of an individual just because they are a peaceful protester. When asked whether that meant that DWP had not received any information or footage from Lancashire police, she refused to comment further. She also refused to say whether DWP accepted that disabled protesters claiming disability benefits had a right to protest. But a Lancashire police spokesman said: “The DWP are a partner agency and where we have information to suggest that fraud may be being committed we have a duty to pass that on, including video footage if we have it. “Do we accept that people with disabilities have a right to protest? Yes, of course we do. “Are we concerned that by passing on information we are setting a dangerous precedent? No we are not. Another force spokesman later confirmed that Lancashire police had passed on information and video footage from Preston New Road to DWP, and he said the force had “a duty” to do so. He denied that this was setting a dangerous precedent that was likely to deter other disabled people from exercising their right to protest, and said: “I don’t think there’s any concerns from our end. When asked if this meant the force believed people claiming disability benefits should not be allowed to take part in protests, he said: “It’s obviously a case by case basis really, what the benefits are being claimed for in terms of their position down at the site. He says in the film: “I think there is a need for an inquiry of some sort into what’s happening with the policing operation overall. Disabled people’s organisations have reacted angrily after the government admitted that it will break its promise to publish its long-delayed adult social care green paper by the end of this year. The Department of Health and Social Care (DHSC) confirmed this week that the green paper would now only be published “at the earliest opportunity” in 2019, as parliament continues to struggle to find a solution to the Brexit crisis. It originally promised that the green paper would be published by the end of 2017, and then July this year, before delaying it to the autumn and then the end of 2018, and now to 2019. DHSC declined to explain the reason for the delay but claimed that its green paper was “a departmental priority”. Last year, the UN’s committee on the rights of persons with disabilities warned that the UK was “going backwards” on independent living, and called on the government to draw up a “comprehensive plan” to address the problem, and to take “urgent action” to ensure disabled people were provided with “adequate support to live independent lives”. Tracey Lazard, chief executive of Inclusion London, said the repeated delays were “simply not good enough”. She said: “The crisis in social care, and the misery it is causing to hundreds of thousands of disabled people, is now undeniable. “Creating a social care system and funding that genuinely promotes and delivers independent living, is one of the great domestic policy and funding challenges the country faces – yet the government acts as though this is a peripheral issue that can be constantly kicked into the long grass. She said the government needed to “urgently show leadership and vision” on the issue. Dr Victoria Armstrong, chief executive of Disability North, said the further delay was “disgraceful” and “clearly demonstrates where disabled people are in terms of priorities for national government”. She said: “It leaves disabled people and disabled people’s organisations facing uncertainty and lacking in confidence that the current government understand or care about the lives of disabled people. “Of course, this isn’t altogether surprising given recent criticisms by UN. Sue Bott, deputy chief executive of Disability Rights UK, said it was no surprise that the green paper – which itself represented a “failure to get to grips with the urgent and growing crisis in social care” – had been “pushed back and pushed back”. She was due yesterday (Wednesday) to attend a roundtable meeting with health and social care secretary Matt Hancock to discuss the possible content of the green paper in relation to working-age disabled people. Bott said she would be “taking the opportunity to let him know how the social care crisis is continuing to deepen”, and she said she hoped he would tell those present that “he understands the implications of the current crisis on disabled people and that solving the funding of social care is now an urgent priority”. Baroness [Jane] Campbell, a disabled crossbench peer who chairs the Independent Living Strategy Group, said she was “not surprised” by the latest green paper delay. The experiences of disabled people whose lives have been devastated by austerity-related cuts were discussed in parliament last night as MPs took part in a long-awaited debate on the impact of eight years of cuts to disability support. The backbench debate was the result of months of lobbying of cross-party MPs by the disabled-led WOWcampaign, which has been pushing for six years for the government to carry out an assessment of the impact of all of its cuts to disabled people’s support. Last night’s was the follow-up to a high-profile debate that took place in the Commons nearly five years ago, after nearly 105,000 people had signed a WOW petition calling on the government to carry out a cumulative impact assessment (CIA). Some of the many accounts from disabled people of how austerity and cuts had impacted on their lives were shared with MPs during last night’s debate, which had been delayed for several hours by an emergency Brexit debate. Labour’s Debbie Abrahams, who secured the Commons debate on behalf of the WOWcampaign with fellow Labour backbencher Kate Green, told MPs how one constituent was refusing to have life-saving surgery on a brain tumour because he had been worried he would have his benefits sanctioned. He had already had his employment and support allowance sanctioned for three months after failing to attend a benefit assessment so he could receive treatment for the tumour. Another disabled person, this time someone with significant mental distress, had described how he had been forced through seven benefit assessments in six years. Abrahams said more and more disabled people were becoming isolated in their own homes and were facing the “relentless stress and anxiety resulting from a social security system that is hostile, unsupportive and even dehumanising”. The disabled MP Stephen Lloyd, formerly a Liberal Democrat but now sitting as an independent, backed calls for a CIA, as did the Scottish Tory MP Luke Graham, who supported the idea of having “an objective assessment of what these changes are doing for our constituents and for the most vulnerable people”. There was also support for a CIA from Jim Shannon, a DUP MP, whose party has been keeping the Conservatives in power since 2017. Shannon said government cuts to disabled people’s and child support were causing “massive issues” in his constituency and “in everybody else’s as well”. He pointed to a CIA published by the Equality and Human Rights Commission (EHRC) in March which found that disabled lone parents with at least one disabled child would lose almost £3 out of every £10 of their net income, almost £10,000 per year, by the time the government’s reforms and cuts were fully implemented in 2021-22. Marsha de Cordova, Labour’s shadow minister for disabled people, thanked WOW for its work over the last six years and for “making the voices of disabled people heard in this house”. She called on the government to “own up to creating a social security system for disabled people that the UN report on extreme poverty described as callous, punitive and mean-spirited”. And she said disabled people had been “consistently and disproportionately impacted by cuts to social care, legal aid, housing, education and social security”. De Cordova said the government’s “pointlessly cruel sanctions regime” had hit more than one million disabled people in the last eight years, while disabled people now faced the introduction of universal credit, which “acts as little more than a vehicle for cuts”. The minister for disabled people, Sarah Newton, said the government was spending more than £50 billion this year on the main health and disability related benefits [this figure includes housing benefit paid to disabled people]. She also claimed that the lack of information on disabled people in the survey data used by the Treasury did not allow a CIA of all government policies at present, although the Office for National Statistics was carrying out work which might mean the necessary data was available in the future. She also said that DWP figures showed that “poverty for people in families with a disabled person has improved since 2010 on three of the four measures, and there was no change in the fourth”. The government has repeatedly refused to carry out a CIA, even though the organisations that have called for one include the UN committee on the rights of persons with disabilities, the government’s own social security advice body, and peers on the House of Lords Equality Act 2010 and disability committee. And the EHRC report in March calculated its own CIA of all the tax, national insurance, social security and minimum wage reforms introduced between May 2010 and January 2018. Abrahams’ motion for the government to carry out a CIA of changes to social security on disabled people was carried, but there is no obligation on the government to act on the motion. The health and social care secretary has failed to produce any evidence that he has put extra plans in place to deal with an adult social care recruitment crisis in the event of a “no deal Brexit”. Despite the ever-increasing likelihood of Britain crashing out of the European Union in March without a deal, Matt Hancock’s Department of Health and Social Care (DHSC) has again been unable to point to any plans it has drawn up to deal with the likely recruitment crisis in social care if there is a no deal Brexit in March. Disabled people who use personal assistants (PAs) have warned repeatedly of the risk that any form of Brexit could mean their access to PAs from EU countries could dry up, with a no-deal Brexit making this even more likely. Inclusion London said this week that the impact of Brexit on social care recruitment was “potentially disastrous”. Although Hancock has insisted that he is planning for the possibility of a no deal Brexit’s impact on the NHS, he and his department have been unable to point to any contingency plans on social care recruitment, other than measures that will be “going ahead regardless” of the Brexit outcome. These include a national recruitment campaign in the new year to “raise the image and profile” of the adult social care sector, following pilot schemes launched last month in Gloucestershire and Tyne and Wear, while an adult social care green paper – postponed yet again this week (see separate story) – will “look at how we can recruit and retain a valued workforce”. DHSC has also pointed to the government’s EU settlement scheme, which will provide the 104,000 EU nationals currently working in social care with the opportunity to continue living in the UK after June 2021. A DHSC spokesman said: “We are confident of reaching a deal with the EU which benefits our health and care workforce. But asked what extra plans DHSC had in place in the event of a no deal Brexit, he refused to comment further. Bott said it was important that the “messaging” of the recruitment campaign was right. She said she had raised this with the Home Office and was due to attend a meeting with that government department yesterday (Wednesday). The government’s new universal credit benefit system could have “disastrous” consequences for disabled people if ministers fail to make a series of major changes, according to a committee of MPs. A report by the Commons work and pensions committee highlighted major flaws in the government’s plans to move disabled people onto universal credit. Frank Field, chair of the committee, warned that the introduction of the new system risked forcing disabled people “further into poverty, deprivation, miserable hardship”. Disabled activists have repeatedly warned that universal credit – which combines six income-related benefits into one – is “rotten to the core”, with “soaring” rates of sanctions and foodbank use in areas where it has been introduced, and repeated warnings about its impact on disabled people. The work and pensions committee says in the new report that those disabled claimants not designated “severely disabled” will be “substantially worse off” under universal credit because of the scrapping of the severe disability premium and enhanced disability premium. But the report also suggests that this will mean that even claimants with higher support needs – a group the government claims it is targeting with higher payments under universal credit – who previously received these premiums will receive less under the new system. The report says: “The Department argues it is, instead, making support for the most ‘severely disabled’ UC claimants more generous than under the legacy system. The committee was unable to clarify yesterday (Wednesday) whether this meant that it believed disabled people who received the premiums would be worse off under universal credit. A Department for Work and Pensions (DWP) spokeswoman also refused to say whether the committee’s statement was correct. Although DWP is providing “transitional protection” for those moving from existing disability benefits and premiums onto universal credit, this will not apply to new universal credit claimants, while the protection will lose value over time. The report says that removing the “vital additional support” provided by the premiums “risks disabled people living more isolated lives, relying more on unpaid care (including from their own young children), or simply being unable to gain support to complete basic daily tasks”. The committee points out that DWP has carried out no analysis of the financial impact of removing the two premiums on disabled people and calls for it to do so “urgently”. The MPs say DWP should include in this analysis “clear worked examples” of the financial support that disabled people claiming different benefits under the old system will receive under universal credit. Disability News Service is currently attempting, through a complaint to the information commissioner, to force DWP to provide similar information. The committee’s report also says – repeating its recommendation from an earlier report on benefit sanctions – that universal credit claimants who are waiting for their work capability assessments (WCAs) should not be forced to accept strict conditions while they are waiting if they can provide a valid “fit note” from their doctor stating that they cannot work. Such a step would restore a “vital safeguard” that “protects claimants from having to meet conditions that may be unmanageable and inappropriate”, the report says. The report says the move to universal credit will leave 100,000 families with disabled children worse off than they would have been under the previous system. And it says that only a third of disabled people making new universal credit claims receive their first payment in full and on time, because of delays in arranging WCAs. The MPs also warn that the simplified process for universal credit claimants who are terminally-ill is failing many people who are forced to prove they have less than six months to live to qualify for the fast-track procedure. The committee calls on DWP to introduce “a more humane approach”. And it says that it is “entirely unacceptable” that DWP has failed to ensure that its online universal credit service is compatible with some of the most basic assistive technologies that disabled claimants might use. It calls on DWP to delay moving disabled people from existing benefits onto universal credit – which is supposed to be “digital by default”, with the vast majority of interactions with DWP taking place online – until this work has been done. The report also points out that the availability of assistive technology on jobcentre computers is “too often patchy and poor”. In response to the report, a DWP spokeswoman said in a statement: “More than a million disabled people will be better off by £100 a month under universal credit and £3 billion of funding will help protect families as they move over from the old system. But the DWP spokeswoman confirmed that the £3 billion was “for all families” and not just those with disabled members, even though the committee’s report is about support for disabled people. Local authorities and the Scottish government are failing to protect the rights of disabled children and young people – and others with support needs – who are being restrained and placed in seclusion at school, according to a children’s rights watchdog. A report by Scotland’s children and young people’s commissioner suggests that some schools and councils may be breaching both the UN Convention on the Rights of the Child (UNCRC) and the UN Convention on the Rights of Persons with Disabilities (UNCRPD). Some schools could be acting unlawfully over their use of seclusion, it adds. Bruce Adamson, the commissioner, said his office had received allegations about the treatment of children in schools across Scotland, and in particular “the use of restraint and seclusion techniques as a method of behaviour management”. Information passed to his office by families suggests restraint and seclusion are used “disproportionately” with disabled children and those with other support needs, his report says. Adamson said: “Our investigation into the use of restraint and seclusion revealed a complete lack of consistency across authorities. “Some authorities record incidents, but have no guidelines; some have guidelines but cannot tell us how often they use the procedure. Adamson said his office has received photographs of disabled children with injuries alleged to have been sustained at school. He said it was not clear if the Scottish government had fulfilled its responsibilities under UNCRC and UNCRPD to embed the rights relating to restraint and seclusion into schools’ policies and practices. The report says that four Scottish local authorities do not have any policies on restraint and seclusion. It calls on the Scottish government to publish a rights-based national policy and guidance on restraint and seclusion in schools. And it says that local authorities should ensure that no restraint or seclusion takes place unless they have “clear consistent” policies and procedures to govern their use. Only 18 of Scotland’s 32 local authorities told the commissioner they recorded all incidents of physical intervention, with the report warning that those authorities that fail to record incidents “have a concerning information gap in relation to the safe and lawful treatment of children in their schools”. The report says it is impossible to say how many incidents of restraint and seclusion take place in Scotland each year and which children are most affected, which it says is “troubling”. It also points to the lack of clarity and consistency in defining restraint and seclusion among different local authorities, and warns of “the potential for dangerously blurred lines between measures like ‘time out’ and ‘seclusion’”. It warns that some schools may be using seclusion as an informal – and therefore unlawful – form of exclusion. And it calls on the Scottish government to develop “clear rights-based definitions of both restraint and seclusion” as part of national policy and guidance. One parent, Sharon Gardner, said: “My own son was regularly locked in a room at school, which he found incredibly upsetting. “Several times he wet himself and was blamed for misbehaving, even though the school knew about his sensory issues and his anxiety. Responding to the report, a Scottish government spokesman said: “We are committed to ensuring the safety and wellbeing of all children and young people, with each council responsible for the care, safety and welfare of pupils in school. “National guidance is clear that physical intervention, physical restraint and supported isolation should only ever be used as a last resort, when in the best interests of the child and never for disciplinary purposes. Below is the text of a statement by Mental Health Resistance Network (MHRN) refuting the charge that they are an anti-Semitic organisation, brought by a former supporter of the organisation Ben Glass. DPAC wish it to be known that we have worked with MHRN closely over many years and we have never seen the merest shred of anti-Semitism, racism nor any form of bigotry by anyone within or associated with that organisation. We will continue our close and friendly relationship with MHRN and the activists that make that organisation a valued partner of DPAC. Further DPAC condemns any group or individual that uses false accusations of anti-Semitism as a weapon to attempt to discredit legitimate campaigning organisations. Not only does this slander the work of decent activists, it also devalues the evil of genuine racism or bigotry that we are all working to defeat. On 5th December 2018 a post appeared on Twitter of a photograph of a former member of Mental Health Resistance Network making a Nazi salute. This was presented as evidence of anti-Semitism and racism within MHRN. However the post was intended to mislead. 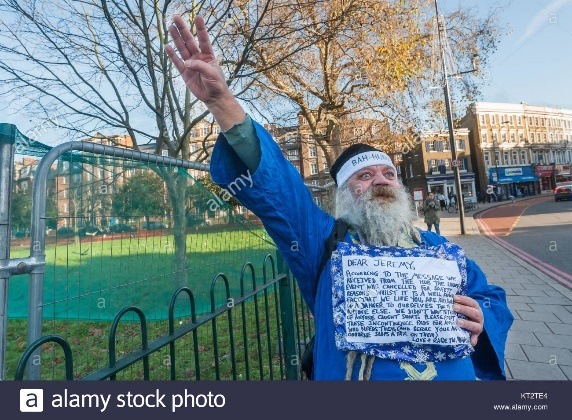 Roy Bard of MHRN makes a Nazi salute to show his opinion of forced back to work treatment for mental health sufferers to be given in the new Southwark ‘hub’ at Thames Reach Employment Academy. However this image has been posted widely on social media with the caption that explains the context having been removed. We believe that it was removed deliberately in order to create confusion and doubt about the nature of MHRN and the wider disability movement. It is clear that the Nazi salute in the image was not in support of Nazism but in condemnation of government initiatives that echo the Nazi persecution of people who live with mental distress. It was clearly meant to highlight – not promote – injustice and persecution of minorities. Thousands of disabled people, including people with mental health problems, were persecuted and killed during the Nazi era of the 1930s/40s. We mourn and remember them alongside their millions of Jewish brothers and sisters, and the many others who suffered at the Nazis’ hands. 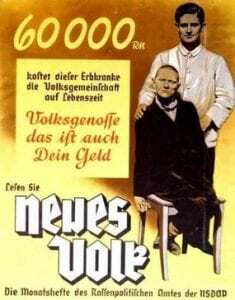 The use of Nazi imagery has been widely used by the disability movement as the present Conservative government has created a hostile environment for us. Much of this hostility focuses on our ‘lack of productivity’ and claims that we are a ‘burden’ on the social security system. This hostility began with a vigorous media propaganda campaign against us by preceding governments. The consequences have been extreme, resulting in deaths, including many suicides. MHRN does not promote or tolerate racism, anti-Semitism, Islamophobia, sexism, classism, fascism and discrimination against LGBT+ people or any other form of discrimination. The posts on Twitter claim that Roy Bard, who left MHRN in 2016, is an anti-Semite. If this is the case (and we have seen no evidence that it is), it has no connection whatsoever with his involvement with MHRN. We campaign solely on domestic issues that impact on people who live with mental distress. Nobody at MHRN is aware of Roy Bard having expressed any anti-Semitic views or acted with any anti-Semitic intent. MHRN has never had any complaints of anti-Semitism before, whether about Roy Bard or anyone else. It is deeply regrettable that, in the name of the legitimate and necessary struggle against anti-Semitism, attempts are being made to defame disabled people who are simply fighting for the financial support and mental health services we desperately need. MHRN exists to end discrimination against people with mental health problems. We oppose all prejudice and bigotry, and are proud to work with all members of the community to achieve our goals. We will oppose any attempt to divide us with false accusations. WOWcampaign/Petition, with the support of MPs Debbie Abrahams and Kate Green, has again secured a debate in the House of Commons through the Back Bench Business Committee; to discuss the urgent need for a cumulative impact assessment of all cuts to disability support. Some of you may say we’ve been here before but every time this Government has been told that their policies disproportionately target cuts at disabled people they just sneer back at us “Fake News, you can’t prove it”. Now is the time to make them prove that what they are saying is right and what we are saying is wrong. How can you help and get involved? Not everyone can travel to London and attend the debate but you can still make a difference from the comfort of your own home. You can share this post on social media as much as you can, you can also add a Twibbon to your social media profile. If you are in London, you can join the protest to support WOW debate on cumulative impact of the cuts on disabled people 12.15-1.15pm Old Palace Yard Westminster London SW1P 3JY (Westminster Underground Jubilee Line accessible from train to street level. Buses 3,11,157,136 all stop near parliament).From 1pm to 4pm on 19th December, use the #WOWDebate hashtag on Twitter to explain how cuts have affected you and your family. Feel free to use your creativity, post videos, poems, art, remember we want to be heard and seen on the day and make people know how austerity and cuts have affected disabled people, carers and their families. Police forces are repeatedly targeting and assaulting disabled people involved in peaceful anti-fracking protests, campaigners have told Disability News Service (DNS). DNS has seen video footage of a string of incidents in which disabled campaigners taking part in peaceful protests have been injured, manhandled or put at risk of injury by police officers. It has also spoken to three disabled protesters, and two other eye-witnesses, who have all experienced or witnessed serious and repeated incidents of police brutality targeted at disabled people. There are now fears that forces across the country that have policed anti-fracking protests are developing a tactics “template” that can be used to target disabled people taking part in other peaceful protests, such as those organised by the anti-cuts and climate change movements. Some of the most recent and serious concerns relate to the actions of officers from Lancashire police in dealing with peaceful protests about the drilling activities of the energy company Cuadrilla near Preston New Road (PNR), on the edge of Blackpool. Maria Allen, who is deaf and has arthritis, has been involved in the Preston New Road protest since it began in January 2017, and in the wider anti-fracking movement for four years. She lives about 20 miles from the fracking site, in an area that is also licensed for fracking, and has family in Blackpool, while a cousin lives less than a mile from the site. She told DNS: “I have been targeted by the police on so many occasions I have lost count. On one occasion she was picked up and thrown into a fence, she said. Another time she was knocked unconscious. She said: “The favourite trick of some of the officers there is to sneak up behind me and grab or shove me without warning. “Or they will issue instructions when they are stood behind me and they know I don’t know what they are saying [because she lip-reads], and then grab or shove me, using the excuse that I did not comply with their request to move. She described the police behaviour she had witnessed as “intimidating, aggressive, confrontational, violent, abusive, disproportionate, frightening”. Allen said: “On numerous occasions I have also seen the police goading and harassing autistic protesters, following them, grabbing them and holding them, calling them names. “Most of us have also been subjected to targeted arrests where we have been arrested on spurious grounds and been held for several hours in police cells. We have then been released without charge. “The police do not only target disabled protesters at PNR; they target anyone they perceive as vulnerable. She believes this targeting of disabled people and other protesters the police see as vulnerable is a deliberate policy, intended to “intimidate people and make them scared to protest”. Allen, a single mother of four disabled sons, said: “After they have assaulted me it takes me a few days to get the courage up to go back. “I believe they also do it to try to provoke a violent response from some of the non-disabled protesters. “At PNR we are primarily a bunch of ordinary, local people. Our whole ethos is non-violent. We never fight back. “Many of us are disabled or vulnerable and the police treat us as if we were football hooligans about to riot. Another disabled protester, Nick Sheldrick, who lives three miles from the fracking site and has a spinal cord injury, is also convinced that he has been targeted by police officers. Since he began attending protests at PNR last year he has been tipped out of his wheelchair six times. He believes only one of these incidents was accidental. The other five times he has been deliberately pushed in his chest, he said. Sheldrick said: “I have told them that if they do that then I am going to go over in my chair. “I have told the senior officers if they need me to go anywhere just ask me and I’ll move. They don’t need to pull me and touch me and drag me. But they do. On one recent occasion he was shoved in the chest by one officer – after being dragged across the road by his shoulders by another officer – and fell backwards and hit his head on the pavement. Because of the treatment he has received, he will no longer attend the protest site alone. On another occasion last year, one officer left him with a bruise covering his thigh after trying to pin him down by putting a knee across his leg. He said this was “the first indication that the police weren’t there for my protection. “I’ve always had a really big respect for the police, I was a merchant navy officer, I’ve never been in trouble in my life. He has also had one officer tell him he should go for a run and then laugh in his face. He lodged a complaint but it was unsuccessful after the officer claimed he had been directing his comment to a nearby group of protesters and not to Sheldrick. Other complaints he has made to the force have all been rejected. In one piece of film shot by a protester, reported by the Mirror and other publications last year, Sheldrick is seen apparently being pulled to the floor in his wheelchair by police officers as he attempts to block a delivery lorry. The publicity around that incident has not stopped officers targeting him. He described the police tactics as “quite brutal” and says that watching officers grab protesters and push them into the hedge is “quite nasty, and sad to watch as well”. He said he has also seen many incidents in which officers have grabbed young women and pulled their tops up to expose their breasts, which he said “looked deliberate”. And Sheldrick said he had seen similar tactics being used by police forces on other protests, as he has watched them live online. One of the disabled people mentioned most often by protesters when asked about police targeting is Liz Beck, from nearby Manchester. She told DNS that she had been thrown or fallen to the ground at least 30 times at Preston New Road, although she also broke her collarbone after an incident at the Horse Hill fracking site in Surrey, footage of which DNS has watched. On every one of these occasions, Beck was carrying her walking-stick. In one piece of footage shot by a protester at Preston New Road and also seen by DNS, Beck can be seen being pushed by a police officer and falling to the ground. The officer then picks her up and drags her across the floor. On her return to Preston New Road after the Horse Hill incident, her arm was in a sling, but that was no protection. Sometimes she falls because she has been pushed or shoved by police officers; on other occasions she has lost her balance while in a crowd being manoeuvred by officers. She has also been pushed into hedges at the side of the road, and on one occasion was pushed from the road and then pushed again so she rolled down to the bottom of a steep bank. She said: “They will either grab you or pinch you or pull you round. I’m unstable, so I go over. “They seem to go for the weaker ones so other people will start getting angry, because everybody is peacefully protesting. “They want people to be violent because then they know what to do, so when it’s peaceful they will make it violent. “They want us to go away quietly, but we have done nothing wrong apart from protest. Miranda Cox is a member of the town council for Kirkham, a couple of miles from the Preston New Road fracking site. She needed an operation after tearing cartilage in her knee at the beginning of last year after police contained a group of protesters and then pushed against them. This year, she received a substantial cut to her arm after she was “lifted up and thrown” onto the road by a police officer. She said: “We have had people knocked unconscious, broken shoulders, broken wrists. These include repeated incidents involving Sheldrick, Allen and Beck. She said: “I have seen Liz [Beck] knocked to the floor several times and I have seen another friend who uses a wheelchair [Sheldrick] tipped to the floor. She said: “I can’t say for certain that those people are targeted but it does seem a bit bizarre to me that someone could be tipped six times from their chair if they are not targeted. “Every occasion [Sheldrick] has been right next to me and I have seen what’s happened and there’s a clear manoeuvre that tips him forwards or backwards or sideways. She is another who believes the targeting of those seen as more vulnerable is a deliberate ploy to undermine the morale and determination of protesters. She said: “It is completely unsafe. The police will say the only reasons they are present at PNR is for our safety, but at the same minute you’re being rugby tackled to the floor or tipped out of your wheelchair. Cox and another local councillor, along with residents and protesters, formally withdrew from monthly meetings with the police last month when they realised the force was “not even paying lip service” to their complaints. None of the complaints that she and others have lodged with the force – to her knowledge – have been upheld. She believes – as do fellow protesters – that police forces across the country are now using the anti-fracking protests as a means of training officers, developing a template to use on other protests. She said: “We have conversations like this all the time. When I look at patterns of police behaviour at different anti-fracking sites, they seem to follow a similar sort of pattern. Another piece of footage shot by protesters, and reported by the Independent last year, shows a disabled member of the Green party, 85-year-old Anne Power, being dragged across a road by police officers while protesting peacefully outside another fracking site, at Little Plumpton, also in Lancashire. DNS has also spoken to Nina Tailor, from Gathering Place Films (GPF), which has been filming anti-fracking protests around the country for more than five years. She said she has grown increasingly surprised by the police behaviour GPF has observed at anti-fracking protests across the country, including the way officers appear to be targeting disabled and older protesters, and women. DNS has seen some of the footage she has shot and collected from protesters for a film GPF is making, Frack It and See, about fracking in the UK. Kevin Blowe, coordinator for the Network for Police Monitoring (NETPOL), believes the police are targeting protesters perceived as vulnerable, including disabled people. He believes this is happening partly to “scare people away” but also to try to provoke a reaction from other protesters, so the police then have an excuse to arrest them. He said: “It’s surprising how many people who have disabilities and who have been prepared to step up seem to be the ones who end up being targeted. NETPOL, which monitors and resists excessive, intimidating or violent policing, is now hoping to encourage some of those protesters who have been injured – including disabled people – to launch legal actions against the police. Blowe is convinced that police forces are rolling out the tactics from one anti-fracking protest to the next, usually starting with the intention of “facilitating” the protest but soon descending into a “zero tolerance” approach to any form of disruption, even though the protests are peaceful. NETPOL will be publishing a series of short films about anti-fracking protests, with one on police targeting of protesters published online today. The danger, he said, is that with disabled people being targeted “you have got to worry that at some point something really terrible is going to happen”. The evidence of protesters from Preston New Road, and other anti-fracking protests, are backed up by two reports. Last year, in Protecting the Planet is not a Crime, NETPOL described seeing evidence – particularly from Lancashire – “of police officers pushing people into hedges, knocking campaigners unconscious, violently dragging older people across the road and shoving others into speeding traffic”. And in March 2016, academics at Liverpool John Moores University and the University of York looked at the policing of the Barton Moss anti-fracking protest camp in their report Keep Moving! They told how protesters described “the provocative targeting of some of the camp’s more ‘vulnerable’ members, including young, elderly and disabled protesters, and women”, which they were told appeared to stem from “a more systemic tactical approach”. DNS put a series of questions to Lancashire police shortly after 5.30pm on Monday – including whether it accepted that it had been targeting disabled protesters, and whether it had guidance for dealing with disabled people at protests – but the force had failed to answer the questions by noon today (Thursday). But a force spokesman said in a statement: “Our intention is to ensure a consistent and coordinated policing response and ensure a balance between the rights of people to lawfully protest, together with the rights of the wider public, including local businesses, to go about their lawful activities. The targeting by police of disabled people involved in peaceful anti-fracking protests is an “absolute outrage” and “a scandal”, but such tactics will soon be rolled out to other protests and other parts of the country, a leading activist has warned. Andy Greene, a member of the national steering group of Disabled People Against Cuts (DPAC), spoke out as Disability News Service (DNS) revealed “extremely disturbing” evidence that police forces in England have been repeatedly targeting and assaulting disabled people involved in the protests (see separate story). Some of the most serious concerns reported this week relate to the actions of officers from Lancashire police in dealing with peaceful protests about the drilling activities of the energy company Cuadrilla near Preston New Road, on the edge of Blackpool. Greene, a veteran of numerous peaceful anti-austerity street protests with DPAC, said the evidence reported by DNS was “extremely disturbing” and the police behaviour “an absolute outrage”. Greene said: “It is an absolute outrage and a scandal that [police officers] are not just perpetrating this but getting away with it on a daily basis now. He said he had seen an “escalation” and a “clear direction of travel” in police tactics since the anti-fracking protests at Balcombe, in Sussex, in the summer of 2013. He said he had been disturbed by what he had seen at Balcombe, but that there had since been a “scale up” of such tactics with the policing of the anti-fracking protests at Barton Moss, near Manchester, in late 2013 and early 2014, while what was being seen at Preston New Road was “an escalation again from Barton Moss”. He said he now expected these police tactics to be “rolled out across the protest movement” over the next year as the country sees a likely increase in political volatility around issues such as anti-fracking, anti-austerity and Brexit. He said he believed it was “only a matter of time” before the tactics being applied to disabled people at Preston New Road were seen on the streets of London. He believes the police have been using the rural locations of anti-fracking protests as a training ground and “the gloves will come off” in London once they are more confident about their ability to translate what they have learned to “bigger scale” protests in London. Greene said the barriers facing disabled people attempting to have their voices heard in anti-fracking protests reflect the discrimination they face in other areas of political activity. Party political activity is often not accessible, while voting is not accessible and polling booths are “an absolute national scandal”, he said. But he said disabled people had become “more confident, more angry” in the last few years, and had become “more present” in anti-fracking, anti-austerity and other protest movements. He said: “What we want to see now is an end to this, we want to see people being facilitated to protest, being supported to protest, to demonstrate, to have their political voice heard. But he urged disabled people not to be put off by what they were hearing of police tactics. He said: “I would absolutely say that they have to meet this challenge head on, in the same way that they have met previous challenges, whether it is the independent living movement, whether it is anti-austerity. “I think we have to confront this and not be cowed. I think we have to challenge what is going on and bring it into the light, and I think we have to fight back against it. Greene said there needed to be “a bigger conversation with the anti-fracking movement about how we deal with this” as well as “a show of support” for those disabled activists who have been targeted. He said protest movements needed to work together with organisations like NETPOL, which monitors and resists excessive, intimidating or violent policing, to “develop some form of plan for supporting ourselves to deal with this and push back against it”. A trio of disabled peers who have all been fierce critics of the discrimination faced by disabled air passengers have delivered a mixed response to the government’s proposed new “passenger charter”. The Department for Transport (DfT) announced on Friday (7 December) that a planned consultation on a new aviation strategy, expected by the end of the year, would include plans for the new charter. A draft version of the charter, seen by Disability News Service (DNS), includes a series of proposals aimed at improving the way disabled passengers and others with reduced mobility are treated by the air travel industry. The government’s announcement came just days after the disabled crossbench peer Baroness [Jane] Campbell called on the government to start handing out “heavy fines” to the air travel industry when it failed to ensure its services were accessible to disabled passengers. Another disabled peer, the Liberal Democrat president, Baroness [Sal] Brinton, told peers last week how she had been left in tears after being dumped in a corner facing a concrete wall while airport staff tried to find her wheelchair following a flight from Heathrow to Madrid. The draft charter includes a plan to remove limits imposed on the compensation paid when a wheelchair is damaged during a flight; and stronger enforcement powers for the Civil Aviation Authority (CAA), which will allow it to fine airlines and other parts of the industry that breach access regulations. There are also proposals to improve the way wheelchairs are stored during flights; to raise awareness among disabled people of airport assistance services; and to tighten standards on how long passengers should wait for their wheelchairs at the end of a flight. If the draft charter was adopted, it would also mean airlines having to make “all reasonable efforts to arrange seating to meet the needs of disabled passengers”, while some new and refurbished aeroplanes would have to include at least one accessible toilet. In addition to the passenger charter, the government is to support a working group from the industry, which will include wheelchair manufacturers, disability representatives and the CAA, to achieve the “longer term goal” of creating a system that will allow disabled passengers to “travel safely in their own wheelchairs in the aircraft cabin”. But the president of the Liberal Democrats, the disabled peer Baroness [Sal] Brinton, told DNS that the charter proposals did not go far enough. She said: “A charter places very little obligation on either the carriers or the airports to deliver. “This means that the disabled traveller will have very little recourse when things go wrong. “Baroness Sugg [the aviation minister] talked about fines for carriers and airports that fail to deliver but we haven’t yet seen how easy it will be for complaints to be made and judgements passed that actually result in fines. “The record on fines for train operating companies missing their targets has been woeful. “A charter will not be enough to change the culture and practice that results in disabled passengers being let down time after time, being treated as a piece of luggage and trapped in disabled ghettos. She added: “This government is very fond of codes and charters which sound great but actually don’t change anything for the consumer because they have no teeth. The crossbench disabled peer Baroness [Jane] Campbell was more optimistic. Although she has not yet been able to examine the charter, because of the Brexit debate occupying both houses of parliament, she said it appeared to be “quite a big leap for the industry and realistically that’s all that can be achieved in the short term (the coming year)”. But she said industry members had now recognised that they “must up their game significantly to address the increasing flow of criticism, otherwise the bad publicity will accelerate dissatisfaction from the public at large, which in turn will damage their business, economically and image wise”. She told DNS: “I am hoping in the slightly longer term, the industry will address what we know from experience will be continuing discrimination with stronger regulations and fines. After speaking to Chris Wood, the father of two disabled sons and founder of the campaign Disabled Flying, she said she believed it was necessary to capitalise on the apparent willingness of some parts of the industry to introduce a way to allow wheelchair-users to travel on aeroplanes in their own wheelchairs. And she said it was crucial that disabled people were “centrally involved” in “developing the design of the reasonable adjustments and advising on the service delivery as a whole, so that it is fit for everyone and discriminates against no-one”, and that it was time to demand “more co-production”. She suggested that disabled people should join Wood’s campaign in the absence of a successful disabled-led alternative, as he had been a “fantastic” ally to disabled people. Another crossbench disabled peer, Baroness [Tanni] Grey-Thompson, said removing limits on compensation for damaged wheelchairs would be “a step forward” and would “make some airlines think a bit”. She also said that the working group would mean that some disabled people who are currently “completely excluded” from flying might have an opportunity to do so, which she said “feels like an open door”. Baroness Grey-Thompson said there still needed to be better recognition that disabled people face “discrimination and poor treatment”, with too many passengers given the impression that their experiences are only one-offs. She said: “I think the charter is a step forward. It should be easier to sort out the problems disabled people face. A spokeswoman for the Equality and Human Rights Commission said: “It is encouraging to see the government putting a major focus on the flying experience of disabled people, especially following the widely reported and unacceptable failures that have occurred in this space. Nusrat Ghani, the DfT accessibility minister, said: “We need to address the fact that 57 per cent of disabled passengers say they find flying and using airports difficult. “That’s why our proposed passenger charter includes measures designed to make real changes that will improve the accessibility of flying, building on the ambitions set out in our Inclusive Transport Strategy earlier this year. Disabled activists have delivered a generally positive response to fresh ideas on how to replace the hated fitness for work test with a new assessment framework that would restore “dignity and respect” to those unable to work full-time. The ideas were presented by disabled researcher and campaigner Catherine Hale at a meeting attended by Labour’s shadow chancellor John McDonnell, shadow work and pensions secretary Margaret Greenwood, and Marsha de Cordova, the party’s shadow minister for disabled people. Last month’s was the second in an ongoing series of meetings – focused on the work capability assessment (WCA) – between senior figures in the party and some of the disabled activists who have played a key role in exposing the harm caused by the government’s social security cuts and reforms. Hale, lead researcher and project manager of the Chronic Illness Inclusion Project (CIIP), and a member of the Spartacus Network, presented some of the ideas she has been working on with fellow Spartacus and CIIP researcher Stef Benstead*. Hale fears that if disabled people do not come up with their own model to replace the hated WCA then something will be imposed on them. She said after the meeting: “If we have to have assessments, I’d rather we designed them and achieved a consensus among ourselves. Any new assessment framework should have four key principles if it is to restore the human rights of disabled people, she says, in a blog subsequently posted on her website**, which was based on her presentation at the meeting. She says such a system should overturn the ideology behind the “hostile environment” created by the government’s social security reforms and restore “dignity and respect” to disabled people; it should change the relationship between work and health; it must empower disabled people; and it should provide an “adequate and secure” baseline standard of living. Hale says that Labour must now commit to removing the “adversarial stance running through all DWP’s assessment systems” which cast disabled people as “guilty until proven innocent”. A Labour government would also need to work to “bring about culture change” within DWP, and “eliminate conditionality and sanctions as a punitive tool for getting disabled people into work”. Compliance interviews, benefit fraud hotlines and “other instruments of intimidation and suspicion” must all be eliminated, she says, as must the outsourcing of assessments to private contractors. She also calls for a new “parity of esteem” between paid work and unpaid work such as caring, volunteering, peer support, and self-care, while she says the NHS should never view whether someone is in work as an indicator of health or recovery. The government should also bring in disabled people to develop new assessment criteria, which should test how disabled people are disadvantaged by both barriers in the labour market and their impairments, says Hale. Reaction from disabled activists to Hale’s presentation, most of who were at the meeting, has been generally positive, although neither Greenwood or de Cordova were able to comment this week. The WOWcampaign, which was represented at the meeting, said Hale’s presentation “was very much in line with the thinking of the WOWcampaign, especially in proposing the ending of the hostile environment (sanctions and conditionality) and stating that the purpose of any assessment must be to empower and enable disabled people”. But a WOW spokesman added: “As stated at the roundtable, WOWcampaign’s concern is that the focus is on the ability of the disabled person seeking work and not on the structural discrimination, prejudice and exclusion that has not only continued but increased in the workplace over the terms of the last two governments. Disability Labour said it was “very impressed” by Hale’s presentation. Wayne Blackburn, co-chair of Disability Labour, who was present at the meeting, said: “We completely agree that disabled people should not be treated as guilty until proven innocent; our knowledge of our own conditions and how they affect us must be believed and respected. Fellow co-chair Fran Springfield, who also attended the meeting, said she supported Hale’s position that paid work was not the only route to social participation, was often not the most appropriate route for disabled people, and must never be damaging to health and wellbeing or used as an indicator of health or recovery. Springfield said: “Bringing back DWP assessments in-house, as a Labour government will do, is so important. “Disabled people should never be abused to provide shareholder profit. “I believe what is absolutely vital is integrating assessments of care and support needs into the assessment of work capability. And she said that providing a secure baseline income was “an essential element of our human rights”, as was “understanding and accepting that some people will never be well enough or able to volunteer or work”. She and Blackburn said Disability Labour was working on how such ideas could be implemented and “look forward to being able to integrate that into the work that John McDonnell’s team is already doing”. Gail Ward, from Black Triangle, said Hale and Benstead had “put forward good arguments for replacement of the WCA”, although she said that Black Triangle had “grave reservations” about Benstead’s suggestion that occupational therapists should be closely involved in a new assessment process. John McArdle, also from Black Triangle, said Hale had “brought forward many excellent ideas”. He said that any incoming government would “have to go at least as far as the Scottish government and consult with disabled people themselves and not those who purport to represent them”. Rick Burgess, of Manchester Disabled People Against Cuts (DPAC), Greater Manchester Coalition of Disabled People (GMCDP) and Recovery in the Bin, said it was “very early days” and the ideas should be seen as “exploring possibilities” rather than drafting plans for a new assessment process. He also stressed that there should be legislation to address the barriers faced by disabled people in the labour market, rather than attempting to address the discrimination they faced solely through social security reforms. He also said the ideological push to see work as a “cure” must not act as an excuse to reduce income or support provided by social security or the social care system. He said: “Catherine and Stef’s work is helpful to add to the all the ideas and ways of thinking we have to engage in. Burgess said he believed disabled people should not look to replace only the WCA and benefits such as personal independence payment, but instead “replace the entire relationship between the state and disabled people which has been a hostile one for so long”. Bob Ellard, a member of the DPAC national steering group, was more critical. He said he did not agree with the principles of Hale’s paper because the ideas centred on the link between social security and work inequality, “and that link needs to be broken”. He said that a fair incapacity benefit system would have to remove that link and be based purely on need, with the government then tackling issues such as “workplace discrimination, access to transport, education and training and other issues that are barriers to disabled people gaining good quality work”. The company that runs the Motability car scheme and the charity that oversees its work are facing fresh criticism from disabled campaigners, following a watchdog’s report that criticises the company’s huge financial reserves and excessive profits and executive pay. The National Audit Office (NAO) report concludes that the Motability scheme has delivered “excellent service” and “remarkable satisfaction levels” (99 per cent in 2017-18) among its more than 600,000 customers. But it also says that the scheme has generated “substantial cash surpluses”, while Motability Operations – the company that runs the scheme – has failed to disclose more than £1.5 million in bonuses that were due to be paid to its chief executive, Mike Betts. It also reports that five Motability Operations executive directors received more than £15 million in bonuses between them in just seven years. In 2016-17, Betts himself received a total financial package of £1.7 million, including his salary and bonuses. NAO found that Motability Operations had £2.62 billion in its reserves in March 2018 and that it had made £2.19 billion in profits between 2007-08 and 2016-17, more than £1 billion higher than it had forecasted. And it says that underestimating the value of used cars meant that disabled customers have been charged £390 million more than was required in their lease agreements to cover the costs of depreciation. But NAO also warns that it is not clear if the Motability charity*, which oversees the work of Motability Operations, could absorb the scale of the extra donations it has received from the company – including an extra £400 million donation in September – as a result of its unplanned profits “in a way that can maximise its effectiveness”. Motability Operations had previously donated £345 million to the charity between 2010 and 2017. NAO’s recommendations include a series of reviews to be carried out by Motability, Motability Operations and the Department for Work and Pensions (DWP). The report also raises concerns about the diversity of Motability’s board of governors, and how long some of them have been in post, with four current governors who have each served for more than 16 years. There is also not a single black and minority ethnic governor, and just one woman among the charity’s 11 governors. Linda Burnip, co-founder of Disabled People Against Cuts (DPAC), said DPAC had started raising concerns about the bonuses paid to Betts several years ago, as well as about the level of reserves held in the charity’s Motability Tenth Anniversary Trust. In 2014, the charity introduced new rules which restricted the grants made from its Specialised Vehicle Fund (SVF) to disabled people with high support needs, which mean that only disabled people who spend more than 12 hours-a-week in education, work, volunteering or caring can qualify for grants that enable them to lease a drive-from-wheelchair vehicle. Burnip said: “There can be no reason, given the billions in [Motability Operations] reserves, for any disabled person to be refused a grant for a drive-from wheelchair or internal transfer vehicle. Ian Jones, co-founder of the WOWcampaign but speaking personally as a Motability customer, said: “Motability Operations has collected and hoarded £2.62 billion (March 2018) of disabled people’s money, which was paid on the understanding it was to cover costs. He said that Motability Operations, which states that all its profits are reinvested into the scheme, had instead effectively paid “dividends” of £745 million to the charity over the last eight years, payments which “grossly exceed the charity’s annual running costs”. Graham Footer, chief executive of Disabled Motoring UK, said: “Many of our charity’s members are on the Motability scheme and have been for a number of years. “While the scheme provides an essential lifeline to these individuals, we believe that Motability could make better use of its surpluses to not only improve the scheme for its customers but alleviate many of the problems they face on a daily basis as disabled motorists. Lord Sterling, who co-founded the Motability scheme in 1977 and now chairs the charity, said it had accepted all NAO’s recommendations, including the need for a review of the level of reserves held by Motability Operations. But he said the suggestion that customers were charged more than was required to cover the leasing costs was “open to further debate” because its customers pay “45 per cent less than the market rate for their vehicles, in addition to the support, insurance and vehicle enhancements that we offer”. He said that “every penny, surplus to sustainability and to this excellent price and service, goes to help enhance the lives of our disabled customers and their families”. He added: “The scheme has cumulatively delivered five million vehicles, many heavily adapted, putting millions of disabled people and their families on ‘the road to freedom’. “I am very glad that Sir Amyas Morse, the comptroller and auditor general at the National Audit Oﬃce, has personally commended the excellence of our service and quality of our management. Motability declined to comment on or answer any further concerns or questions this week, including what impact the NAO report might have on how much disabled customers pay for their Motability vehicles and the service they receive, although it said there were exceptions to the SVF rules. A spokeswoman said the charity would not be issuing further comments ahead of a new inquiry to be held by MPs in the new year. Motability Operations welcomed the NAO report and said it was “proud that it has acknowledged the impressive performance of the company, and the excellent service it offers to 625,000 disabled people and their families”. In response to the report, it said it would improve its reporting of executive pay and bonuses and review its approach to forecasting. It will also develop, with the charity, a 10-year plan for how profits are re-invested or donated and will work with the charity to support an independent review of reserves. Motability Operations also announced that Betts would step down as chief executive by May 2020. The Commons work and pensions and Treasury committees will be holding a fresh inquiry into the Motability scheme in the new year. Frank Field, the Labour MP who chairs the work and pensions committee, said – in a letter to work and pensions secretary Amber Rudd – that the NAO report made for “grim reading”. He said the “value of the scheme cannot be allowed to blind us to serious concerns about its governance – not least the unjustifiably high levels of executive pay and the colossal financial reserves built up by Motability Operations”. A DWP spokeswoman said: “We asked the NAO to investigate and are grateful for the valuable insight provided, which strengthens our concerns regarding Motability Operation’s financial model. “We agree with the NAO’s finding that the Motability scheme provides an excellent service. Work and pensions secretary Amber Rudd has announced measures that should mean fewer disabled people are forced to undergo unnecessary benefit reassessments. Sarah Newton, the minister for disabled people, announced in June that new claimants of personal independence payment (PIP) with the “most severe, lifelong conditions” who were awarded the highest level of support and whose needs were not expected to decrease would only receive a “light touch” review of their award every 10 years. Rudd said this week that this measure would be extended to existing PIP claimants. The Department for Work and Pensions (DWP) said this was to “ensure that for disabled people who need extra support, the system is designed to be as seamless as possible while minimising any unnecessary stress or bureaucracy”. Guidance for PIP case managers on which new PIP claimants will qualify for the “light touch” review and an “ongoing” award was published quietly by DWP in August. The guidance does not mention any particular conditions. Instead, it says such an award should be made if “the claimant’s restrictions on Daily Living and/or Mobility are stable and unlikely to change significantly or they have very high levels of needs which will only deteriorate” or if “the claimant is awarded enhanced/enhanced and their needs are not going to improve or would only deteriorate”. Newton’s announcement in June was seen by some as another move back towards disability living allowance (DLA), the benefit PIP is replacing for working-age claimants. One of the key reasons that ministers gave for introducing PIP was that DLA supposedly allowed claimants to secure unchecked “welfare for life” because of the lack of repeat assessments. Esther McVey, who quit as work and pensions secretary last month, made the claim herself five years ago in a bid to justify the introduction of PIP and proposed cuts of 20 per cent. But Jenny Morris, who helped write the Labour government’s Improving the Life Chances of Disabled People white paper, said in June that people were placed on lifetime DLA awards “for very good reasons” and all the government had done by introducing PIP and its frequent reassessments in 2013 was to “create extra costs for themselves”. She said that the “light touch” announcement showed the government had spent years and wasted hundreds of millions of pounds on its PIP reforms, while exposing people to assessments that were “very oppressive and upsetting”. This week, one disabled people’s organisation, Buckinghamshire Disability Service (BuDS), suggested that Rudd’s announcement should be treated “very cautiously”. The government should implement major changes to the scheme that provides funding for disabled people in England to make access improvements to their homes, according to an independent review. Among the suggested improvements, the review says the government should increase the upper limit on disabled facilities grants (DFGs) from £30,000, although only in line with inflation. It also suggests renaming the grant as part of a national awareness-raising campaign, with a new name that is “up to date and easily recognisable”; producing a fairer and more transparent funding formula; and introducing a national accreditation scheme for builders and tradespeople carrying out adaptations. In October’s budget, the chancellor announced another £55 million in funding for DFGs for 2018-19, following a previous decision to increase funding for DFGs from £220 million in 2015-16 to £505 million in 2019-20. But the review points out that, although the government has already more than doubled DFG funding in recent years, the contribution of local authorities has fallen, which has meant the number of homes adapted – at least until 2016-17 – “has not significantly increased”. The review, Disabled Facilities Grant and Other Adaptations, says the DFG is “often seen as simply providing level access showers, stair lifts and ramps”. Instead, the review suggests, there should be “a fresh approach that is all-encompassing and creates a home environment that enables disabled people to live a full life”. The review says the way the DFG system is delivered varies widely across different areas, and it makes recommendations for improvements, including the need to bring together occupational therapists and housing staff into single integrated teams, which is already happening in some areas and will “simplify and speed up customer journeys”. Among other recommendations, the review says that housing and health partnership boards should be set up in every part of England to have responsibility for meeting the housing needs of disabled and older people in their area and maximise the impact of DFGs. The review was commissioned by the Ministry of Housing, Communities and Local Government and the Department of Health and Social Care and was carried out by the University of the West of England; Foundations, the national body for home improvement agencies; the Building Research Establishment; and Ferret Information Systems. The government said it was “carefully considering the findings”. A user-led music charity has launched a major survey of disabled musicians in a bid to push for improvements to the accessibility of performing, rehearsing and recording spaces. Attitude is Everything’s (AiE) NEXT STAGE project has already secured the support of leading disabled musicians such as Blaine Harrison of Mystery Jets, singer-songwriter and violinist Gaelynn Lea, Kris Halpin from Winter of ’82, and Rob Maddison from Revenge of Calculon. AiE is now looking for disabled and Deaf musicians to take part in the nationwide survey and provide information about their own experiences of rehearsing, recording, playing live, attending industry events and applying for arts funding. The charity has previously focused on improving accessibility for disabled people who attend festivals and live music gigs, but its new project aims to support the music industry to develop inclusive spaces for performing live, recording, networking and pursuing a career in music. AiE hopes to use the survey results to develop a comprehensive network of disabled artists, musicians, songwriters and DJs. Suzanne Bull, AiE’s chief executive, said: “We have spent almost 20 years working for disabled audiences and now, with support from Arts Council England, we want to improve accessibility for disabled artists. “This process will not be easy. The challenges facing Deaf and disabled people are often hidden, and rarely discussed publicly. There are a range of stigmas and sensibilities. “So our first goal is to collect information through a comprehensive and wide-reaching survey. Harrison, an AiE patron, said that “hearing the experiences and voices of disabled artists will hugely diversify and enrich the music industry of tomorrow”. He said: “Since we started out playing shows there has been a huge shift in the music industry’s attitude towards deaf and disabled audiences. “It’s been so inspiring to see live-signing catching on at gigs and festivals, not to mention how popular viewing platforms have become. “And when you’re up there it’s not hard to see why. The atmosphere is one of shared joy; reminding us that the live music experience is one we can all participate in. “But backstage, it’s often another story. Dressing rooms can be tucked away up steep flights of stairs in the eaves of the building; if there are lifts they are often made for hauling heavy equipment and not safe to ride in unattended. Maddison added: “Whilst on tour, disabled artists often encounter huge problems in terms of accessible transport and accommodation, the last thing we need is to arrive at the venue we’re booked to perform at only to find out that it is totally inaccessible as well. Much more needs to be done to ensure that disabled people and other groups in fuel poverty can benefit from energy efficiency schemes, according to a new report. The report says that disabled people often have higher energy demands, because of factors such as health-related needs to keep warm and the electricity needed to use equipment such as nebulisers, stair lifts and hoists, and to charge wheelchairs. The report, published by the UK Energy Research Centre, University of York, and ACE Research, says this can lead to both higher energy costs and a greater risk of harm if energy supplies are disconnected. The report says current policy is focused too much on targets and providing work to improve the energy efficiency of homes – such as installing cavity wall insulation and replacing inefficient boilers – at the lowest possible cost. Because disabled people often live in the poorest quality homes and need extra support through the installation process, they are often side-lined by those providing schemes such as the government’s Energy Company Obligation (ECO) energy efficiency programme. They also face other barriers, such as problems caused by the disruption of the energy supply while installation is taking place, the inaccessibility of the application process and the difficulty of carrying out preparatory work, such as clearing a loft space. There are also “high levels of mistrust” of the energy sector. Among its recommendations, the report calls for the government to reinstate a taxpayer-funded scheme in England, where there has been no such programme since the demise of Warm Front in 2013, even though Scotland, Wales and Northern Ireland all operate such schemes. It calls for investment in energy efficiency support in England to be “brought up to par with the devolved nations with the reintroduction of a tax-payer funded energy efficiency scheme”. It also concludes that “the trustworthiness of energy efficiency programmes needs to be improved, most notably in England”. As well as the report, Policy Pathways to Justice in Energy Efficiency, the two-year research project has also published a guide for those working in the sector on supporting disabled people, Supporting Fuel Poor Disabled People Through Energy Efficiency Measures. Disability Rights UK (DR UK), which helped deliver the project, said the research showed how current policy was “overly focused on targets and low-cost provision to the exclusion of the people living in fuel poor homes”. It said the research also shows how households in need are “difficult to find, that they do not receive adequate information that is accessible and from a trusted source, and how their needs are not always taken into consideration during the installation process”. Sue Bott, deputy chief executive of DR UK, said that delivery of energy efficiency policy was “variable and patchy”, and there was “a lack of knowledge and awareness of the specific needs of disabled people”. She said that 30 per cent of families living in poverty contain a disabled person and are at particular risk of experiencing fuel poverty. She said: “Too often fuel poverty is thought of as an issue that only impacts older disabled people, but the reality is that fuel poverty blights the lives of disabled people of any age: from children, to adults of working age, to older people. Dr Joanne Wade, chief executive of ACE, said: “In short, the needs of older people – important though they undoubtedly are – have been prioritised above those of people with disabilities and long-term health conditions, and those of families with young children. “All these groups are vulnerable to the ill-effects of cold homes, and many people within them also have greater than average needs for energy services. The new work and pensions secretary, Amber Rudd, has announced details of a new voluntary programme for disabled people who are long-term unemployed. The programme aims to provide “highly personalised packages of employment support for people who are at least a year away from moving into work”, with the target of supporting 10,000 disabled people over four years. Those on the scheme will receive coaching to “build their independence, confidence and motivation, as well as work experience to help boost their career prospects”. The scheme will be rolled out across England and Wales in 2019, providing support for up to 21 months, including six months of in-work support for those who secure a job. Rudd said: “Everyone, no matter what their background is, should have the opportunity to thrive in the workplace, and having the right support in place for disabled people is one of my greatest priorities. The Department for Work and Pensions (DWP) said the £40 million funding for the scheme – to be spread over four years – had not come from the cuts of nearly £30-a-week in payments to new claimants of employment and support allowance who are placed in the work-related activity group (WRAG), a measure that was introduced last year. The government has predicted that it will save an estimated £450 million a year from the WRAG cuts by 2020-21 and has said it will invest a total of £330 million of those savings over four years from April 2017 in employment support for those affected. Why we should expose Schools illegal Off- Rolling of pupils? Ofsted, the schools inspection service have been concerned in recent months at data suggesting some pupils have been moved off the school register and removed from their school. Disabled pupils and those described as having special educational needs, are more likely to be subject to this practice, called “ off-rolled” This happened to one young person Pat (not the real name) who was recently off- rolled from a, state funded, secondary school in Greater Manchester. Pat is 14, has a diagnosis of Autism, also has the protection of an EHCP. Pat had three years of 100% attendance at the school and although Pat did not find the school met all support needs, Pat accepted responsibility and gave a commitment to hard work. This was reflected in Pat’s academic achievements, test results clearly indicated academic progress, year on year. An incident occurred when Pat was allocated a new support worker. The support person had been in post 5 days, no formal training to work with neuro – diverse pupils. The support worker did not know Pat, it was the lack of a meaningful relationship with Pat that triggered Pat’s “melt down” Pat will not be the first neuro-diverse person to have a melt down in school and Pat will almost certainly not be the last person to have a melt down. A melt down is likely when the school does not anticipate the triggers for a particular pupil and has not put appropriate support in place. This resulted in Pat being suspended from school for two days. Pat was utterly devastated, uncertain what had happened. Pat’s mother attended the school to discuss what had happened, she was confronted by the headteacher and the head of SEN services from the local authority. There was no discussion, Pat’s mother was told to remove Pat to a “ autism school” 35 miles from their home or have Pat “homed schooled” This “choice” was imposed upon Pat’s mother by the head of SEN, supported by the headteacher without any consultation. This illegal action from two senior professionals is now being challenged. It is however, expected that both professionals will deny their actions and re- present their arguments as “ considered advice” in the “ best interests” of the young person. What is disturbing is that if the two senior professionals were confident in their judgments were in Pat’s best interest – why did they not follow the appropriate procedures and engage in the formal process of an EHCP review, with representatives from health and social care ? Why did the SEN local authority lead professional not take into consideration Pat’s views ? in fact he has never met Pat. Why have Pat’s teachers, health and care professionals not taken action to protect Pat from this abuse of Pat’s rights and a total disregard of the EHCP ? What is unforgivable is that the “professionals” surrounding Pat have allowed Pat to be presented as “the problem” and for Pat to take responsibility for the abuse of the professionals. Pat is not the only young person being subject to this despicable and systematic professional abuse, but is one of a growing number, identified by Ofsted. This practice is a consequence of a wider concerted devaluation of disabled people in the UK, by this government, which has given licence to such malpractice against disabled people. What disabled child is safe from the malpractice of such senior professionals In schools and colleges ? What parent can say with Confidence their child is safe from being off-rolled by their school ? As a starting point we should encourage every such incident to be reported to Ofsted and Governors of the school. The minister for disabled people has been unable to explain why she failed to make any public statement to support disabled people’s battle for rights on the UN’s International Day of Persons with Disabilities (IDPD). It is the second year in a row that Sarah Newton has apparently demonstrated a lack of interest in domestic and international efforts to further their rights. Last year, Newton failed to organise or attend any IDPD events on the day, which is celebrated around the world, or send any messages of support through her Twitter or Facebook accounts. This year, her Twitter page was again silent, other than retweeting a couple of messages sent by her Office for Disability Issues about an event she had attended, while her Facebook page failed to make any mention of the day. Her silence on the UN’s international day of disabled people contrasted with her support for Carers Rights Day, which had taken place three days earlier, with Newton telling her followers on 30 November that she wanted to “say a huge thank you to carers across the country for the great work they do each and every day supporting the most vulnerable in society”. Newton’s parliamentary office declined to comment and referred Disability News Service (DNS) to the Department for Work and Pensions (DWP). A DWP spokeswoman said: “It’s frankly ludicrous to cast aspersions about someone’s allegiance to a day based on whether they have posted online or on social media. She declined to say if Newton would apologise. The press release about the appointment of the new disability sector champions, which was issued on Monday, did include a quote from Newton, but her comment failed to mention the UN international day. Newton’s failure to support the UN day contrasted with Labour’s shadow minister for disabled people, Marsha de Cordova, who released a video “to celebrate the contributions disabled people make everyday” and their struggle for rights, and to call for an end to the “hostile environment” they faced because of government policies. She also hosted a meeting, organised by the TUC disabled workers’ committee, Unite the union and Disabled People Against Cuts (see separate story), which called for the government’s universal credit benefit system to be scrapped, although de Cordova herself did not call for it to be scrapped because Labour’s position is still to “pause and fix” the system. De Cordova told DNS: “The UN international day of disabled people is crucial to promoting the rights of disabled people in Britain and across the globe. “This government has shown a shocking disregard for the day itself, and the importance of what it represents. Newton’s government has been repeatedly and severely criticised by the United Nations for severe breaches of its human rights obligations. Only last month, the UN’s special rapporteur on extreme poverty and human rights said the government had inflicted “great misery” on disabled people and other marginalised groups, with ministers in a state of “denial” about the impact of their policies. And last year, the UN’s committee on the rights of persons with disabilities delivered a damning verdict on the government’s progress in implementing the UN Convention on the Rights of Persons with Disabilities, with its chair saying that cuts to social security and other support for disabled people had caused “a human catastrophe” in the UK. Disabled activists have fought back against what they say are attempts by the government and big business to “hijack” the UN International Day of Persons with Disabilities through their support for a purple-themed campaign that focuses on disability employment. The #PurpleLightUp campaign, which was launched last year, aims to celebrate the economic contribution of disabled employees. It is led by PurpleSpace, a disabled-led organisation which describes itself as a “professional development hub for disabled employee networks” and is headed by Kate Nash, a former chief executive of RADAR, one of the three disability organisations that merged to become Disability Rights UK. Among those supporting the #PurpleLightUp campaign on Monday’s international day were the Department for Work and Pensions (DWP), the Treasury, controversial government contractor Atos – which produced purple lovehearts and cupcakes to mark the day – and accountancy giant PricewaterhouseCoopers. It was also supported by banking giants Lloyds Bank and HSBC, both closely associated with the global recession that led to government austerity policies that have caused misery for hundreds of thousands of disabled people in the UK since 2010. But disabled activists are furious at how they believe the campaign has “hijacked” the UN’s International Day of Persons with Disabilities (IDPD), which focuses on the rights of disabled people. The theme of this year’s UN international day was supposed to be empowering disabled people and ensuring “inclusiveness and equality” on development issues. Now disabled activists have begun a fightback, calling for the UN day to be marked in the future with what they say are the true colours of the disabled people’s movement: turquoise and yellow. Cllr Pam Thomas, a disabled Labour councillor on Liverpool City Council and a former member of the Disabled People’s Direct Action Network (DAN), persuaded her council to light up its civic buildings on Monday in turquoise and yellow. She said these colours had been used by disabled people’s campaigns for equality since the 1990s, with accounts from the period suggesting that turquoise represented “unity” and yellow stood for “freedom”. Among the more recent UK disability rights battles that have used turquoise and yellow was the campaign to save the Independent Living Fund. Thomas said #PurpleLightUp was “not about disabled people’s rights, but about economic activity”, and she pointed to its close connection with DWP and its discredited Disability Confident employment scheme. She said: “What is really annoying me is that Purple Light Up has taken our international day for their own agenda. “Disabled people are experiencing the extreme hardships of ideologically-imposed austerity, as shown in several different reports, our own organisations have had funding cut and hardly any remain. She said she was “so disappointed” that disabled people would support the involvement of these organisations in #PurpleLightUp, “knowing what Atos and all the other government departments have done to disabled people. Disabled activists have pointed out that DWP has been repeatedly shamed by the UN for its grievous breaches of international rights treaties, including the UN Convention on the Rights of Persons with Disabilities. She said she would now push the Labour party and trade unions to adopt yellow and turquoise as the colours of the disabled people’s civil rights movement. Nash defended her organisation’s #PurpleLightUp campaign. She said the idea came from disabled employees wanting to move away from discussions of “deficit”, “welfare reform” and “getting people into work” and towards sharing “stories of success” and disabled people’s contribution “to economies and civil society”. Nash* said 3 December was chosen “as a mark of deep respect to the UN International Day of Persons with Disabilities”. She added: “PurpleSpace applauds the Convention on the Rights of Persons with Disabilities, an international human rights treaty of the United Nations intended to protect the rights and dignity of persons with disabilities. Nash said: “Our members are from many different types of organisations – we support employee networks and resources groups irrespective of the nature of the business of the organisation, and wherever they are on the journey of change. But the disabled actor and activist Liz Carr was another to express her anger at the hijacking of the international day. She said on Twitter: “Happy international day of disabled people to all the fantastic crips who make this world a better place just by existing. Fran Springfield, co-chair of Disability Labour, said: “It is absolutely a hijack which is why the idea of using the turquoise and yellow is absolutely brilliant because it takes it away from their level of commercialism which is what it’s about. Their bottom line is money. She said the #PurpleLightUp campaign was “window-dressing. It has nothing to do with our rights. Liverpool City Council also helped celebrate the UN day with the international disability arts festival DaDaFest, which ends on Saturday and has been taking place across the city region since 1 November. A government-commissioned review* set up to modernise the Mental Health Act has been criticised for falling “significantly short” of recommending full human rights for people in mental distress. The review, published today (Thursday), includes 154 recommendations for improvements to the Mental Health Act 1983 that its chair, Professor Sir Simon Wessely, says would make it easier for mental health service-users to say how they want to be treated and harder for those requests to be ignored. The prime minister this morning welcomed the report, announced plans for a new mental health bill, and said the government would respond formally in the new year. But nearly 150 user-led organisations, allies and individual campaigners – led by the National Survivor User Network (NSUN) – have previously warned that the review appeared to be backing away from the need for fundamental reform of the act. They have argued that there needs to be “full compliance” with the UN Convention on the Rights of Persons with Disabilities, with action taken to comply with recommendations made to the UK government last year by the convention’s committee. NSUN was today highly critical of Wessely’s report, and said many user-led organisations, individuals with lived experience and allies were “disappointed and feel let down” by support for its recommendations from professionals, many mental health charities and some human rights organisations. She said the review had failed to address the concerns raised by NSUN and its supporters in letters to the review in May and October. Full implementation of the convention would mean – among other changes – an end to detentions, substitute decision-making [appointing someone to make decisions on behalf of a service-user, rather than providing them with support to make the decision themselves] and compulsory treatment. When asked by Disability News Service at a press conference yesterday why the review had not recommended full implementation of the UN convention, Wessely said that “those kind of recommendations go too far”. He said the review’s recommendations had “done a lot” to move towards the “very clear and concrete” changes to human rights that the convention demands. But he said the UN convention made it clear that the Mental Health Act and the Mental Capacity Act were not compatible with the treaty. He said: “I think the truth is that we don’t think that’s right. We don’t think much of the public will think that’s right, we don’t think service-users will and we don’t think parliament will. He said there had to be a balance between the need to respect autonomy and “looking after the vulnerable” and he said the review’s recommendations would mean “full compliance” with the European Convention on Human Rights. Among the 300-page report’s recommendations are a proposal to create new advance choice documents, which would enable people to make choices and statements about their future inpatient care and would be “easier to make, and far more difficult to ignore” than current methods of expressing views about future treatment for those detained or at risk of being detained under the act. There should also be earlier access to second opinions about treatment, and the right to challenge decisions made by tribunals. Service-users would be able to choose the person who would have power to take decisions for them if they lacked capacity themselves, rather than having to be allocated a “nearest relative”. The review also calls for “systematic” improvements by services to take account of the local population’s ethnic and cultural backgrounds, and there is a call to address the frequent inappropriate use of the act to detain autistic people and those with learning difficulties. The review also said that decisions to give compulsory treatment or detain someone in hospital should be “clearly explained and recorded”, while the harm being mitigated by detaining someone must be recorded and would have to be “significant”. It also calls for a “substantial” reduction in the use of community treatment orders, particularly for black African and Caribbean people. And it says that police cells should never be used as a “place of safety” for those who meet the criteria for detention under the act. The review also calls for improvements to the physical environment of wards “through co-design and co-production with people of relevant lived experience, to maximise homeliness and therapeutic benefit and minimise institutionalisation”. The review’s recommendations have been welcomed by people with lived experience of mental distress who advised or worked on the review. Steve Gilbert, a vice-chair of the review and chair of its service-user and carer group, a member of the working group that advised the review’s leadership, and a trustee of the mental health charity Mind, said: “No one person in our group agreed on everything. Asked by DNS about the influence of service-users on the recommendations, Gilbert said they were “fundamental” to the review process and “right there at the centre”, while “in some respects it was service-users leading the development of the recommendations”. She said the review’s recommendations would “empower patients to be involved in their care, to make choices when they are well that would be harder to over-rule and to have better access to doctors and tribunals for a review of how and where they are treated”. But the NSUN spokeswoman said: “People with mental health diagnoses should be able to enjoy the same human rights as other people have; under the review recommendations, this will not be the case. “There has been a failure to draw directly on the type of supported decision-making set out in UNCRPD documentation in relation to people whom clinicians designate as ‘not capable’. “The review report continues to employ an essentially clinical model for understanding and approaching mental distress, despite the fact that significant numbers of service-users have found these unhelpful and despite growing scientific challenges to the evidence base for these. And she said there was also “a concerning lack of focus on other intersectional issues, such as gender and gender identity, sexual orientation, older age, including dementia, other disability issues and disadvantaged socio-economic status”. The government could be forced into court to defend its failure to make the much-criticised universal credit benefit system accessible to disabled people. A parliamentary meeting held to mark the International Day of Persons with Disabilities (IDPD) on Monday – and to call for universal credit to be scrapped – heard that disabled campaigners are now seeking claimants willing to help challenge the government’s apparent breach of equality laws. Inclusion London’s Disability Justice Project (DJP) is considering various possible legal challenges, which could include the failure of jobcentres to make the process accessible for disabled people forced to apply for universal credit, and the failure to assess the impact of the system on disabled people. Another possible legal challenge could address how the rollout of universal credit has led to disabled people losing accessible housing, or not being able to secure housing that meets their access needs. DJP is also examining the impact of sanctions and conditions imposed on disabled people through universal credit and whether that could form the basis of a legal action. Tracey Lazard, chief executive of Inclusion London, and also representing the Reclaiming Our Futures Alliance, told the parliamentary meeting that it was a “disgrace” that the government had never carried out an equality impact assessment of the universal credit system, even though it “disproportionately affects disabled people”. She said universal credit was “fundamentally inaccessible”, with an online system that appeared to have been designed to exclude hundreds of thousands of people from using it, and which disregarded the many disabled people who have never used the internet, and the hundreds of thousands who only have sporadic online access. Lazard said she could not think of a better event to mark IDPD because universal credit provided a “live, current danger to disabled people now” and despite recent government concessions it “continues to be devastatingly unfit for purpose”. She said there was a “growing number of deaths linked to universal credit” and “widespread experience of a downward spiral of sanctions, debt, food and fuel poverty”, and even destitution, and a regime that was “instilling terror and anxiety in hundreds of thousands of disabled people”. Lazard said universal credit had been “ideologically designed” to be “punitive and hostile”, and she said disabled people must “refuse to be guinea pigs” in the government’s “ideological experiment”. The event was organised by the TUC disabled workers’ committee, Unite the union and Disabled People Against Cuts, and was hosted by Labour’s shadow minister for disabled people, Marsha de Cordova. Dave Allan, chair of the national disabled members’ committee of Unite, reminded the meeting that the annual TUC Congress unanimously approved a motion he had moved in September that called on the Labour party to shift its stance on universal credit and promise to scrap the system. Labour’s policy is currently to simply “pause and fix” universal credit rather than scrapping it. The motion had previously been approved by disabled trade unionists at May’s TUC Disabled Workers’ Conference. Allan said there was a need for a broad alliance to “put massive pressure” on the government to scrap universal credit. But he said there was also a need to pressure Labour’s frontbench to commit to scrapping universal credit. Dorothy Gould, a freelance researcher, trainer and consultant for the National Survivor User Network (NSUN), said people with serious psychological trauma were seeing their mental distress “severely” worsened by the “huge problems associated with universal credit”. She said people were finding themselves “trapped in a cycle of assessment, rejection and appeals”, and she said the assessment system was “particularly unsuitable for people in mental distress”. NSUN has been collecting individual accounts of the impact of universal credit. One woman has told NSUN how the fear of disability cuts over the last two years had given her the most severe mental breakdown she had had in 44 years, involving eight months of illness, six weeks in a psychiatric unit and six months of recovery, which was ongoing. Gould said NSUN was urgently calling on the government to address the “trauma and injustice” caused both by universal credit and people’s experience of the Mental Health Act (see separate story). Dr Liz Okokon, co-disability officer and women’s officer for Dulwich and West Norwood Labour party and a Unite activist, who works in the NHS, said it was important to feel “positive and hopeful” because “so many people are not going to give up and give in”. She said: “We can do something about this, we can make a difference, we can change. She pointed out how the telling of individual stories of the Windrush scandal had brought it to the mass media. She said: “Telling these stories really is really important. “We must remember that we are valued as people, not just as commodities, not just those who will go out and bring in a couple of tax dollars. Miriam Binder, from Disabled People Against Cuts, said it was important to recognise that universal credit was being introduced “at a time of unprecedented cuts in our social infrastructure”. She said: “The whole universal credit process is essentially draconian and not fit for purpose. “It is punitive and takes no heed of the personal circumstances of those who are obliged to turn to it. The parliamentary event came just two days after a national day of action by Unite against universal credit saw 90 different actions across the country. Sean McGovern, co-chair of the disabled workers’ committee, said activists now needed to persuade Labour to scrap universal credit. He said universal credit was an “atrocious social policy” that had already killed “innumerable people” and activists needed to discuss the campaign to scrap universal credit with constituency Labour parties and trade unions. He said there would not be a formal campaigning alliance but groups needed to work together, including disabled people’s organisations and other grassroots groups, to push for universal credit to be scrapped under a Labour government. *Disabled people who have ongoing problems or concerns with universal credit or have had problems in the last couple of months, and are interested in a potential legal challenge on these or other grounds, can contact Svetlana Kotova at Inclusion London by emailing: Svetlana.Kotova@inclusionlondon.org.uk although Inclusion London cannot offer advice on individual claims. A disabled shadow minister told activists she was on the verge of tears after House of Commons authorities provided them with an inaccessible meeting room for an event being held to celebrate the UN’s international day of disabled people. Marsha de Cordova is to write to the Commons speaker to raise her concerns about access problems at Monday’s event, which she was hosting and was organised by the TUC disabled workers’ committee, Unite the union and Disabled People Against Cuts. The day after the event, parliament was congratulated by the minister for disabled people, Sarah Newton, for being “Disability Confident”, under the government’s discredited disability employment scheme, which her press office said was “a sign of its commitment to being inclusive and open to all”. As well as problems with microphones, and fixed furniture which made it difficult for disabled people to move around the Commons committee room, wheelchair-users who were due to address the meeting on Monday were unable to reach the platform. Most of the main speakers, including the chair, Sean McGovern, were forced to speak from a small, cramped space in front of the platform or from other parts of the room, while one wheelchair-user ended up having to speak into a microphone with her back to the meeting because of the lack of space. The meeting had originally been scheduled to take place in an accessible room in the more modern Portcullis House but had to be moved to make way for a select committee meeting. De Cordova told them she had been assured by the parliamentary authorities “that there would be no access issues” with the replacement room. A House of Commons spokesman said: “We are very sorry to hear about the problems which Ms de Cordova and attendees at her event experienced when visiting parliament. “As part of parliament’s core democratic function, select committee business takes precedence over other events which occasionally [results] in private bookings being moved at short notice. He said the House of Commons and the Parliamentary Digital Service had both signed up to Disability Confident, while the House of Commons worked with the Business Disability Forum and had appointed a workplace adjustment advisor “to be a designated point of contact for members and their staff throughout their time in parliament”. In February, a disabled peer told the House of Lords that plans for a major “restoration and renewal” of the Houses of Parliament must ensure a “step change” in the provision of disability access in a building that could be “extremely unwelcoming” to disabled people. Baroness [Sal] Brinton, president of the Liberal Democrats, said the newly-restored palace would have “failed” if it was not “truly accessible” to all disabled people. She said that the building itself – and a “wider, unconscious cultural attitude” – could make the Houses of Parliament “extremely unwelcoming to disabled parliamentarians, staff and visitors”. The Department for Work and Pensions (DWP) has been accused of misleading disabled people about its links to the disability organisation that organised a controversial accessible shopping event. Disabled activists called last month for a boycott of Purple Tuesday, the UK’s first accessible shopping day, because of its close links with DWP, and concerns that CCTV footage of disabled people shopping could be used to dispute disability benefit claims. DWP also said that Purple “does not have any contract or agreement with DWP”. But Disability News Service (DNS) has now established that both these statements were deeply misleading, while the first was untrue. DWP has twice provided significant levels of funding to Purple – although not for Purple Tuesday – with the latest agreement for a programme run through the local jobcentre ending on 31 July and separate funding for a government disability employment programme ending in August 2017. Disability Labour said it was “appalled, but not surprised” at the links between DWP and Purple. Wayne Blackburn, co-chair of Disability Labour, said: “It seems the DWP’s statements about its relationship with the Purple organisation have been less than truthful. Fran Springfield, co-chair of Disability Labour, added: “Any organisation led by disabled people that takes money from the DWP betrays disabled people. “That is why we campaigned and will continue to campaign against Purple Tuesday. Purple said last month that it had received “not one penny” from DWP for the Purple Tuesday campaign, which was “not government-led or involved or paid for in any shape or form”. Mike Adams, Purple’s chief executive, confirmed this week that the organisation had received DWP funding, but not for Purple Tuesday. He said he was comfortable that what he said last month was accurate but was “frustrated” that DWP’s statements “could have been seen as misleading”. He said: “Purple Tuesday has not received one penny of government funding. Never has and never will and it is not a government campaign. “The minister [Sarah Newton] likes it [but] they don’t own it, its not theirs. “Separately, and very separate to Purple Tuesday, Purple has received funding for other… projects or initiatives from DWP. He said he was “frustrated” that questions were being unfairly asked of Purple, and he said he was “very proud” of the work Purple did on those two projects for DWP, and its work on Purple Tuesday. In the wake of last month’s event, DNS had submitted a freedom of information request to DWP, asking how much funding had been given by DWP to Purple in each of the last three years. But it said it was delaying its response because it was considering seeking an exemption under section 43 (2) of the Freedom of Information Act*. DWP refused to answer questions about its funding of Purple this week. Adams said he was “surprised” that DWP had not spoken to him about the concerns this week. Purple is a community interest company which replaced the former Essex Coalition of Disabled People, which itself had become known as ecdp. Many of Purple’s board members are disabled people, and the organisation provides training for employers, and works with disabled people to find jobs, recruit personal assistants and manage their direct payments. As well as running Purple Tuesday, it also charges up to £10,000 to help other organisations become accredited under DWP’s Disability Confident employment scheme. The new funding was first announced in May after lawyers for three disabled politicians – Labour’s Emily Brothers, Liberal Democrat David Buxton and the Green party’s Simeon Hart – wrote to the government to warn that the government had breached the Equality Act by failing to reopen the Access to Elected Office Fund. Half of disabled cyclists fear having their benefits cut or removed if they are seen to be physically active, according to a survey released on the UN’s international day of disabled people. The results of the survey of more than 200 disabled cyclists by the disabled people’s organisation Wheels for Wellbeing showed that of the 49 per cent who were concerned about their benefits, one in six (17 per cent) had been discouraged from cycling, cycled less or given up cycling altogether. Only two months ago, a report by the disability sports organisation Activity Alliance found that four-fifths (83 per cent) of disabled people surveyed would like to be more active, but nearly half (47 per cent) feared losing their benefits if they took more exercise. But she said that cycling doesn’t “make your impairment magically disappear” and so to “penalise people because they use a cycle to move around, as well as or instead of a wheelchair say, is just lazy and discriminatory”. She called on the Department for Work and Pensions to clarify its position on how disability benefits are affected by cycling. The Wheels for Wellbeing survey was just one of a string of events and publications held and released on the international day on Monday (3 December). The disabled peer Lord [Chris] Holmes published a review which calls for “urgent action” to tackle the under-representation of disabled people in appointments to public bodies such as NHS organisations, national museums and regulatory and advisory bodies. He said it was shocking that, last year, just three per cent of people who had previously been appointed to public bodies described themselves as disabled, although the figures are slowly improving, with 6.9 per cent of new appointments who shared their status in 2017-18 reporting that they were disabled. The Tory peer called for an interim target of 11.3 per cent of all public appointees to be disabled people, while he also called for “reliable, consistent, comprehensive” data on how many disabled public appointees there were, for the government to take “innovative” approaches to recruitment, and for a more accessible applications process. He suggested there should be less reliance on panel interviews and more open processes such as the use of shadowing current appointees, holding mock board meetings, and making better use of technology, with new efforts to attract and nurture disabled talent, for example by using mentors and role models. The government makes more than 1,000 appointments to the boards of more than 500 public bodies every year, with those organisations spending more than £200 billion of public money. Meanwhile, the Office for Disability Issues (ODI) used the UN international day to announce that the government was setting up a new network of “regional stakeholders” who will organise forums for organisations and individuals in nine regions across England. The forums are intended to “provide a channel for disabled people and their organisations to share their views and experiences about policies and services that affect them and will complement stakeholder relationships that already exist across government”. ODI said it would publish more information about how to join the regional stakeholder network “shortly”. The forums appear to be a replacement for the Fulfilling Potential Forum, the Disability Action Alliance and the Fulfilling Potential Policy Advice Service, all of which were set up by the coalition government but have either been scrapped or fallen into disuse. The minister for disabled people, Sarah Newton, also announced that the government was looking for six new “champions” to tackle some of the issues disabled people face as consumers. The six individuals will be asked to use their influential status as leaders in their own industries to promote the benefits of being inclusive to disabled people across fashion, technology, countryside and heritage, website accessibility, food and drink, and product design. They will join 14 existing sector champions in areas such as airports, banking, insurance, live music, retail and tourism. The disabled-led arts organisation Together! 2012, based in east London, announced on Monday that it had been awarded nearly £230,000 lottery funding that will allow it to expand its Clubs creative development programme for disabled people over the three years from 2019. Together! also held a live-streamed reading of the easy-read version of the UN Convention on the Rights of Persons with Disabilities, at Beckton Globe Library. As part of their celebrations of the day, York Independent Living Network and York Human Rights City Network organised a live video link that brought together students from York and Urbino in Italy who had won prizes in this year’s Eleanor Worthington Prize to talk about their work and celebrate the day. Elsewhere on the UN international day, the Centre for Disability Studies and the Centre for Law and Social Justice at the University of Leeds held a screening of Sanctuary, an award-winning film which follows the relationship between two people with learning difficulties. The screening was followed by a question and answer session with the director, Len Collin, the university’s Professor Gerard Quinn, and representatives of CHANGE, the Leeds-based, disabled-led organisation that focuses on the human rights of people with learning difficulties. In London, Merton Centre for Independent Living released a series of short films on independent living. A disabled crossbench peer has called on the government to start handing out “heavy fines” to the air travel industry when it fails to ensure that its services are accessible to disabled passengers. Baroness [Jane] Campbell asked the government on Monday what action it was taking to encourage all UK airports to provide appropriate facilities for disabled people. Another disabled peer described how she was left in tears after being dumped in a corner facing a concrete wall while airport staff tried to find her wheelchair. Baroness Campbell pointed to the Civil Aviation Authority’s (CAA) third annual report into the assistance provided at the UK’s biggest airports, which said that one in 10 of those surveyed had described the quality of assistance provided in 2017-18 as “very poor”. Baroness Campbell said: “Examples include being left in a wheelchair, being left on an aeroplane, expensive wheelchairs being broken and, in my case, being left on an aeroplane for two hours because they refused to bring my chair to the plane door. “In the light of this, can the minister assure the house that the government’s aviation strategy will contain more stringent ways to address this outrageous discrimination with more than just guidance and regulations that we know do not work? Baroness Sugg, the junior transport minister, failed to say how many disabled people were involved in the strategy, but she said it was due to be published “in the coming weeks”, and promised that it would address these issues. She said the CAA survey results were “obviously not good enough”. Within three hours of asking her questions, Baroness Campbell had been contacted by the Airport Operators Association, seeking a meeting to discuss the issues she had raised. Another disabled peer, the Liberal Democrat president, Baroness [Sal] Brinton, told the minister how when she arrived on a flight from Heathrow to Madrid last month she was told her wheelchair was missing. She said: “I was then passed from pillar to post and was dumped in a corner facing a concrete wall by staff who were trying to sort out what was going on. “I ended up in tears while they tried to find my wheelchair. “If this were an unusual occurrence, it would be horrific, but it is not. “What is even more horrific is that this happens every day to air passengers. Baroness Sugg told her: “She is absolutely right that these occurrences happen far too often, and that is what we need to change. She said the government was “working closely with the aviation industry, the CAA, wheelchair manufacturers and disability organisations to achieve the long-term goal of enabling wheelchair-users to travel with their own airworthy wheelchair on a plane”. Following the questions she asked in the Lords, Baroness Campbell was contacted on Twitter by a string of other disabled people sharing their own experiences of airport and airline inaccessibility and discriminatory attitudes. One fellow disabled peer, Baroness [Tanni] Grey-Thompson, told her: “I’ve had the pilot tell the plane that we’re leaving late because of ‘having to board a wheelchair’. Another to share her experience was Sophie Christiansen, the eight-time Paralympic gold-medallist, who shared an experience from last week. And Anna Severwright, co-chair of the Coalition for Collaborative Care, told Baroness Campbell: “Let’s hope they are willing to listen and change. A key document that helped many disabled activists develop their understanding of how they were being oppressed by society more than 40 years ago has been published for the first time. The document, Are We Oppressed?, was compiled in 1974 by Vic Finkelstein, one of the pioneers of the disabled people’s movement, and it played a significant part in the development of what was later described as the social model of disability. It was developed through discussions among members of the newly-formed and radical Union of the Physically Impaired Against Segregation (UPIAS) and came from circulars issued by post to members every few weeks. Two years before the document was drawn up, Finkelstein helped found UPIAS with Paul Hunt, who had spent much of his life in Leonard Cheshire residential homes and campaigned against institutional discrimination. The 2018 edition of Are We Oppressed? includes a new introduction written by Judy Hunt – Paul Hunt’s widow – and UPIAS member Maggie Davis, who herself was a significant figure in the development of the movement. It was published this week on 3 December, the UN’s International Day of Persons with Disabilities. The document has been prepared, with their support, by Tony Baldwinson, whose wife Lorraine Gradwell, who died last year, was another UPIAS member and later a founding member of Greater Manchester Coalition of Disabled People (GMCDP). Baldwinson pulled the new version of the document together from old stapled cuttings and Finkelstein’s typed and handwritten slips of paper. Preserving the UPIAS papers is part of a wider archiving project by GMCDP. Are We Oppressed? includes a series of influential comments by Finkelstein, often described as the father of the social model, as well as responses from other UPIAS members, although their comments have been anonymised. Among Finkelstein’s comments, he told fellow members: “At the outset of starting our new organisation we must be sure and in total agreement about one thing – Disabled people are oppressed in our society. In another circular, he said that “1970s society has already reached the stage where the technological solutions are at hand for full integration of physically impaired members of society. He also told UPIAS members: “However, I suggest that the real reason for our oppression (as for all other oppressed groups) is in the way society is organised (the socio-political causes). And, in a comment that is likely to be seized on by members of today’s disabled people’s anti-cuts movement, he warned: “In economic crises, when competition is increased, we are amongst the first to suffer (together with the other oppressed groups). Although his ideas were taken on and played a significant part in the foundation of the disabled people’s movement in the UK and the social model of disability, some members questioned his radical tone, with some of their comments likely to be viewed today as disablist. One responded: “I’m worried a little as to our situation – I mean how radical are we going to be? “Are we to sit in the streets waving placards, chanting thereby attracting publicity as a curiosity value – a freak show? Judy Hunt told Disability News Service this week that she had passed huge amounts of UPIAS material to Baldwinson for his archiving work, which included two copies of Are We Oppressed? She said she believed the document “still has a value” because so much of what Finkelstein said was still relevant today. She said: “He argued people through it. It was a process people in the union were going through at the time. She said she believed that disabled people were still oppressed. “I think they are. What’s happening now is a lot of things stripping back, and people being forced into institutions again because they cannot get the support in the community. “They are having their benefits cut so a lot of people are going to be struggling just to survive at home. “They are not being allowed to participate as full citizens in many cases. “There’s a much more mixed picture now. On the one hand there are people able to get to university and going into mainstream schooling and go and get jobs and get careers. “But on the converse, people are losing their benefits and there is a real danger of institutionalisation again and it’s happening for some people, and in education too… with disabled children having difficulty getting access to mainstream schooling. What’s your experience of the welfare safety net? The Work and Pensions Select Committee has opened an inquiry into the current state of the UK’s welfare safety net, prompted by the evidence of debt, hunger and homelessness it has heard across several recent inquiries. The inquiry will look at how effectively our welfare system works to protect against hardship and chronic deprivation. The UK’s welfare system is currently undergoing fundamental reform – the transition to Universal Credit alongside other major and largely untested reforms like Benefit sanctions and the Benefit cap, also there is the freeze on benefits. Have you experienced hardship because of changes in you benefits? Your experience will inform Inclusion London’s evidence to the inquiry. Please send to Henrietta.Doyle@inclusionlondon.org.uk by 12 December.